Ocracoke Island's first residents were a small tribe of Native Americans who were known as the "Woccocock." Many historians believe that subsequent mispronunciations of this name by explorers, colonists, and later residents, eventually led to the island's moniker of "Ocracoke." Ocracoke first appeared on a European map in 1585, after John White made explorations along the North Carolina shoreline. Settlements of small colonists were reported as early as the 17th century, but it wasn't until the State Government stepped in during the early 18th century that the town began to "boom" as a community of fishermen, farmers,mariners, and pilots who manned the treacherous waters both offshore and along Ocracoke Island. The community really made waves when a notorious pirate decided it was one of his favorite haunts in the 1710s. Edward Teach, more commonly known as Blackbeard the Pirate, would party onshore in the small village, and lurk around the adjacent inlet to loot passing merchant ships. His coastal North Carolina reign came to an end just off of Ocracoke as well, when he was finally captured and killed by a British Navy Ship commandeered by Capt. Robert Maynard. The area of water just off the coast of Ocracoke Village is now referred to as "Teach's Hole." Ocracoke would fade from the national spotlight after Blackbeard, but the region continued to thrive as more settlers arrived in the area. By the late 1790s, more than 165 residents called Ocracoke home, and the island, as well as its neighbor Portsmouth Island, were becoming well-known among local merchant mariners. Ocracoke also played a small but key role in the Civil War, World War I, and World War II. The island was home to a small Confederate fort, which was abandoned in 1861 when the Union troops captured Hatteras Island. During the two World Wars, Ocracoke was also dangerously close to the barrage of German U-Boats that lurked just off the coastline. In 1942, bodies of British Sailors washed ashore from the torpedoed HMS Bedforshire, and the community subsequently set up a British Cemetery in their honor. Throughout the centuries, Ocracoke remained isolated and rarely visited until the 1950s. During this decade, the Cape Hatteras National Seashore was established, two ferries were purchased by the state of North Carolina, and NC Highway 12 was constructed along the island. After this series of events, the island was discovered by a new generation of explorers - namely fishermen, hunters, and rugged vacationers who were intrigued by the region's isolation. After a town-wide water system was installed in the late 1970s, Ocracoke began its steady rise to the popular tourist destination that it is today. The year-round population is still in the hundreds, but now thousands of vacationers take a summer day-trip or weekly vacation to this historic and isolated Outer Banks destination. The following timeline presents a brief overview of some of Ocracoke Island's most memorable, or most notorious, moments in history. 16th Century - Ocracoke is inhabited by local Native Americans, known as the "Wokokon." The name eventually evolves to "Okercock" and then Ocracoke. Late 1580s - Sir Walter Raleigh lands on the island during a coastal expedition. 1715 - The North Carolina colonial government passes a measure to settle Seafaring Pilots on Ocracoke to help guide vessels through the dangerous Diamond Shoals and Ocracoke Inlet waters. 1718 - The famed pirate Blackbeard is captured and beheaded off the coast of Ocracoke. 1753 - Ocracoke is officially recognized as a "town." 20-30 families now live on the island and call Ocracoke home. 1753 - Portsmouth Island, which is just south of Ocracoke Island, is colonized. Portsmouth eventually becomes one of the largest settlements along the Outer Banks. 1790 - The US Census reports that Ocracoke Village is home to roughly 165 people, which includes 31 slaves. 1798 - The first Ocracoke Island Lighthouse is constructed on Shell Castle rock. It is later destroyed by lightning in 1818. 1823 - The current Ocracoke Lighthouse is built and put into operation at the edge of Silver Lake Harbor. 1861 - Fort Ocracoke, a Confederate fort that was constructed at the onsought of the Civil War, is abandoned and destroyed as Union Forces take over neighboring Hatteras Island. 1940s - During World War II, German Submarines that lay just offshore destroy several British Ships. The bodies of British soldiers wash ashore and the British Cemetery is built in Ocracoke Village to properly and respectively bury the remains of four sailors that were aboard the HMS Bedforshire. 1940s - Ferry service to Ocracoke Island begins from Hatteras Island, thanks to local entrepreneurs who run a privately owned vessel. 1953 - The Cape Hatteras National Seashore is established, which includes the beaches of Ocracoke Island. 1956 - North Carolina builds a paved road - NC Highway 12 - which runs the length of the island. 1960s - The state of North Carolina also purchases a second privately-owned ferry that connects Ocracoke Island with Cedar Island on the mainland of North Carolina. 1970s - The last two Portsmouth Island residents - two elderly ladies and longtime residents - leave Portsmouth Island. The village becomes deserted, and later becomes an isolated tourist destination managed by the National Park Service. 1977 - A water system is installed, replacing old hand pumps and cisterns. 1990s - North Carolina State University conducts a study on the "Ocracoke Brogue," a unique dialect that's thought to be similar to old 18th Century English. 1998 - Remnants of Fort Ocracoke are discovered. 2002 - 31 acres of the Springer's Point Nature Preserve are opened to the public. An additional 91 acres are added and opened as well in 2006. See Ocracoke Island's history up-close with a visit to any of these historic sites and attractions. Ocracoke Pony Pen - Located just a few miles south of the Hatteras Ferry Docks, the Ocracoke Pony Pen is where visitors can spot the famed Banker Ponies, which are thought to be the descendants of Spanish shipwrecks from the 1500s and 1600s. Docile and noticeably smaller than modern horses, the ponies can be admired via an outlaying fence that borders NC Highway 12. British Cemetery - This small cemetery is home to four British Sailors who were washed ashore after their trawler, the HMS Bedforshire, was torpedoed by a German submarine on May 11, 1942. The cemetery is identified by a small white picket fence, and a British flag that towers overhead. The fag is replaced annually with a new British flag sent by Queen Elizabeth II, and a Memorial Service is help every year in May. Portsmouth Village - Portsmouth Village is located across the Ocracoke Inlet, and is a historic settlement that has been effectively abandoned since the 1970s. Visitors can take a private ferry from Cedar Island, or a Portsmouth Island ATV tour from the docks of Silver Lake Harbor, to access isolated Portsmouth Island. Once onshore, visitors can explore a number of structures that still remain in this one thriving settlement, including the original Methodist Church, the general store, and a collection of residences. Ocracoke Island Lighthouse - Built in 1823, the small Ocracoke Island lighthouse was instrumental in guiding mariners through Ocracoke Inlet, and has been shining a beam across the island for nearly 200 years. While not open to the public, visitors can take a walk or bike ride to snap photos of this iconic and oldest lighthouse on the Outer Banks up close. Springer's Point - Historians believe that this little section of the village was once the stomping grounds of Blackbeard the Pirate, and modern visitors can follow his footsteps along nicely tended nature trails that lead to the Pamlico Sound. The small soundfront beach overlooks the famed "Teach's Hole," where Blackbeard made his last stand and was inevitably killed in 1718. 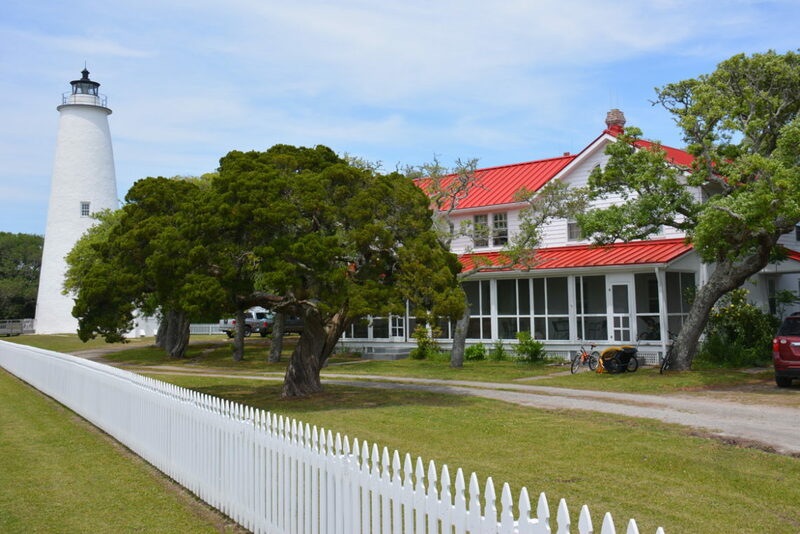 Ocracoke Preservation Museum - This museum is located in the historic 1900 David Williams Home and features a wealth of research materials for historians and journalists. The museum also has a far-reaching collection of local exhibits, and the house itself is listed on the National Register of Historic Places.